A black beast which had been killing sheep in the Highlands has been identified as a member of the Scottish wild cat family. The fact that the animal is black baffled experts but they now consider that it is a hitherto unknown melanistic mutation of the wild cat. The beast was one of three shot in the same area near Dallas, Moray, two years ago and eventually taken to the Natural History Museum in London for identification. Because some of the bones were missing in the carcass when it arrived the museum are being ultra-cautious with their investigations before declaring what the species is. But a spokesman said yesterday: "It is definitely not a puma." At Torquay, Di Frances, a naturalist who has spent years trying to prove the existence of a new species of big cat in Britain, said: "This isn't the same as the 'Beast of Exmoor' or Dartmoor which I am still trying to catch. And it proves there are things in the hills which we didn't know existed." "Our tests and x-rays came up with the fact that it is a member of the Scottish wildcat family. 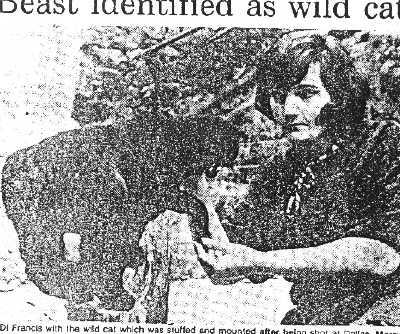 A black Scottish wild cat is something we believed until now that didn't exist. It is an exciting discovery and all the more so that we know there are others in the area where this was shot and are known to be breeding." The beast is jet black and no bigger than the average Scottish wild cat which is invariably tabby in colour.